I enjoyed being back on the radio today. Last Sunday I was up in Michigan so there was no show. Up in Mancelona, people get tired of winter and all the snow, but I only experience it once a year. Walking the snowy streets on a cold night with my dog, hearing the snow crunch under my boots - that's about as close to happiness as I get. Maybe if I spent the whole winter there I would get tired of it too, but I love my week up north. Now, the 850-mile drive, I could do without, but being there makes it worth it. 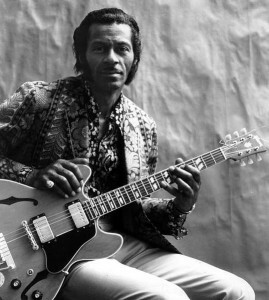 Featured Chuck Berry today. While his songs are, musically speaking, quite simple, the stories he tells are always compelling. Nick and Gaby edge Jim Dandy to be this week's cover contest winners. b) Name somebody who has covered it - I was thinking Lauryn Hill or Nancy Wilson, but others include The Supremes, and Englebert Humperdink. I couldn't find any evidence that Tom Jones covered it, Jim. c) Name a film or TV show in which it has been used - I was thinking "The Deer Hunter." Nick answered "Jersey Boys," which Wikipedia corroborates. Jim says that Heath Ledger sings it in "10 Things I Hate about You." I don't know, Jim. Nothing about that on Wikipedia, but that doesn't mean you're wrong. Although Nick Lowe's "Cruel to be Kind" is heard in that flick. 2. 3 Cohens with Christian McBride covered "Squeeze Me (But Don't Tease Me)". Whose tune is it? - Duke Ellington's. 4. Johnny Cash sang "The Beast in Me." Whose tune is it? - Nick Lowe's. By the way Cash also covered Lowe's "Without Love." In fact, Nick was once married to Cash's daughter. Catamount Community Radio, Sunday mornings 10-12 on WWCU-FM. More fun that 3.14159 baboons. You're a stand up guy. That's one of the 10 things I love about you.